The venture capital and private equity (PE) ecosystem in Southeast Asia is entering a new phase of growth as investments in the region reach record levels, according to global management consulting firm Bain & Co. The region had seen low levels of investment over the past decade, with PE investments ranging from US$6 billion to US$9 billion a year. However, 2017 marked the turn of the tide as the number of recorded venture capital deals rose to 524 — four times the level in 2012 — and PE deal value rose 75% to US$15 billion, breaking out of a decade-long phase of flat growth. The reason for this development? Suvir Varma, partner and Asia head of private equity at Bain & Co, puts it down to four factors. “First, the amount of money invested in the region was significantly higher than before. Second, the money was put to work not by a concentrated sets of people such as Temasek Holdings and Khazanah Nasional Bhd, but by a broad range of investors, including global and local PE and venture capital funds,” he says. The third factor is the rapid rise in valuations. This trend is driven by the emergence of unicorns, which are oftentimes regional businesses. Southeast Asia has seen 10 unicorns emerge since 2012, with a combined market share of US$34 billion. Singapore-based Grab, gaming and e-commerce player Sea, Lazada Group and Go-Jek Indonesia are among the examples. Many PE and venture capital firms have seen their investments in the region reap superior returns over the years. “A lot of these people want to put more money back into PE and venture capital because they are making so much money from investing in these asset classes,” says Varma. According to the report, exit deal value rose to US$16 billion in 2017, up 86% from the previous five-year average. It notes that Southeast Asia is expected to produce at least 10 new unicorns by 2024 and the total deal value over the next five years will reach US$70 billion, which is double the level of the previous five years. The boom in PE and venture capital investments did not come as a surprise as Bain had been tracking dry powder (referring to committed but unspent capital) in the region for the past few years. The dry powder in Southeast Asia-dedicated funds has more than doubled since 2012, signalling more potential investments down the road. “The amount of dry powder has been on a steady and rapid rise. For many years now, we have been waiting for that to be unleashed,” says Alex Boulton, principal at Bain & Co.
As more money pours into Southeast Asia, investors face increasing competition and higher valuations. According to the report, valuation multiples in the region hit a 10-year high in 2017. Investors in the healthcare and medical technology sectors, for example, are facing particularly intense competition. “Today, the pricing is not cheap. So, if you are buying at those multiples, it is not only about buying a good company but also what you can do to increase its value so you can make the kind of returns you want. 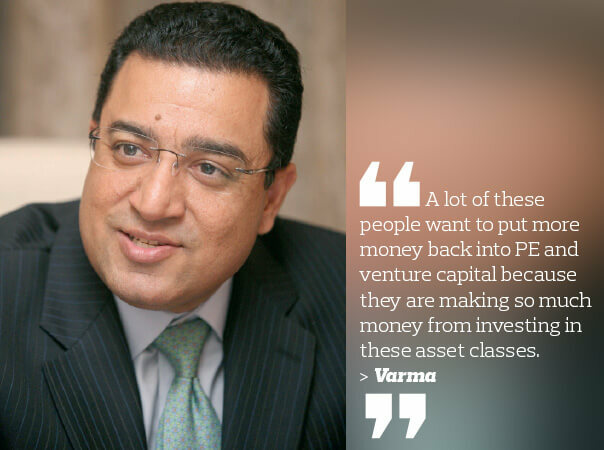 Money is available, but we will have to see how well the PE and venture capital firms find and execute deals to keep the cycle going,” says Varma. The current global uncertainties, such as the US-China trade war and slowing global growth, have not affected PE and venture capital firms’ appetite for investments so far, observe Varma and Boulton. While events such as a trade war will impact the earnings of some companies, it is not necessarily a point of concern for PE or venture capital firms that want to make new deals so long as valuations go down in tandem, Varma points out. “If valuations do not go down, but earnings go down, then that is a bad thing because your return is going to decrease. The question then is whether the valuations are adjusted when the earnings are impacted,” he says. For PE and venture capital firms with existing investments, they may have to intensify their efforts to help investees deal with macroeconomic shake-ups and engage in more downside protection planning. “For example, how are we going to deal with the possibility of us losing our manufacturing facility in China because we cannot supply to the US from there now? Then we had better find another facility in Vietnam or Thailand,” says Varma. The technology sector and other consumption-based industries are likely to sustain their high levels of investment in the region. In 2017, 40% of the total deal count was in tech companies. According to a survey by Bain & Co, more than 60% of Southeast Asian investors cite technology as their main aim for the coming year, with financial technology as the largest segment. Healthcare and education are two other areas that will attract significant interest. “While these sectors are hot right now, there are plenty of attractive opportunities elsewhere. The reason PE is getting excited about healthcare and education is that these sectors are insulated from a recession. If something goes wrong, people are still keen to spend more of their income on healthcare or education,” says Boulton. In terms of countries, Singapore remains the region’s investment hub, but Indonesia and Vietnam are expected to pick up the pace as the next hottest markets in the region. According to the report, the two countries generated 20% of the region’s PE deal value over the past five years. Among the factors contributing to the interest are high internet penetration and digital savviness of the population. “Fundamentally, it is the population factor that attracts most investors. The eyeballs drive the clicks online and that drives the spending. This is about how much money you can extract from the services and that is why these countries are getting a lot of the attention,” says Varma. Based on Varma and Boulton’s interactions with investors, they find that many are still taking a wait-and-see approach to investing in Malaysia due to the uncertainties in its economic policies and outlook. “[Investors] have been pleasantly surprised by the efficiency or smoothness at which the regime change happened. But at the same time, they are not entirely sure which sectors will be more or less in favour, or if there will be any significant changes to economic policies,” says Varma. The report points out that venture capital and PE firms in the region are looking for companies that operate in attractive sectors, have secular growth trends, are potentially linked to consumer demand and, to an extent, are recession-insulated. The financial metrics and quality of the management team are additional factors of consideration.